eBay buyers are able to haggle with sellers through the Best Offer feature, and eBay announced Tuesday it will give buyers the ability to specify the expiration of their offer. "We believe this change will increase the use of Best Offer and create additional sales opportunities for sellers that use it," eBay said. The expiration periods (12, 24, and 48 hours) will require a seller response prior to expiration in order for the transaction to remain valid. "This will benefit buyers who have to make a decision on their purchases within a shorter time frame, and allow them to consider listings they may otherwise have passed over," it further explained. Because eBay is rolling it out to a "select group" of buyers as it prepares to launch the new feature, it advised sellers that they might begin to see offers with shorter expiration periods. 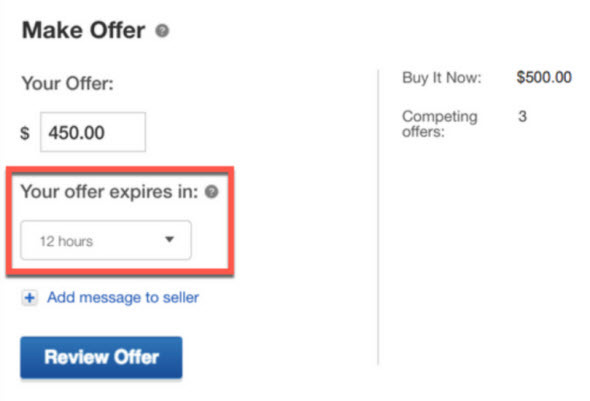 eBay also reminded sellers they can set up auto accept and decline thresholds. "You can automatically accept any offers that are above a $ amount or automatically decline offers that are below a $ amount. You can set automation options for your listings with the listing tools and on the "manage offers" page." Sellers who use the Quick Listing tool have had to accept offers; do you think eBay will eventually make it mandatory for all sellers? 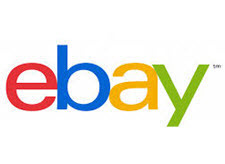 Let us know what you think of Best Offer and of the new functionality eBay is providing buyers. Update 3/20/19: During today's eBay Weekly Chat session, a seller asked, "If I receive a 12 hour offer from a buyer, do I have a choice of duration for my counter offer?" An eBay moderator responded, "this is a good question we've been looking for an answer on today - we're still waiting to get more detail but I'll update you as I hear back on this one!" Of course they will make it mandatory....which means sellers who want a certain price will have to offer those items at a "pie in the sky" price pre haggle. It's going to aggravate buyers who will get annoyed that their 25-75% offer of LESS than asking price is summarily rejected by software set to refuse any offer under 10%. What a waste of everyone's time....Ebay should rebrand itself as Ebay Bazaar-where every item is a rug that's to be haggled to death over. My items are "Haggle Free" priced. . . If I sold them any cheaper it would be a crime! Id say it is harmless, but this is Ebay and it will be "glitched" and end up costing sellers somehow. eBay is so desperate for sales, I'm amazed they haven't initiated a policy where if a buyer makes an offer, and the seller doesn't respond within a certain time period, the buyer gets the item at the price they offered. With my buyer hat on, I actually like this feature when I'm shopping for used items, though I can understand why many sellers would not care for it, especially those selling new products with slim margins. I don't see rolling best offer acceptance as mandatory to all sellers, however. Non-business sellers, yes quite possibly. This is another step towards Wenig's vision of making eBay a bid-ask marketplace that functions like a stock exchange. Both buyers and sellers will be provided increasing capability to send and receive offers on a one-to-many basis (instead of the one-to-one way Best Offer works now) that function similarly to Limit Orders in a stock exchange in an effort to revitalize stagnant GMV and revenue growth (it's also part of the reason for the new GTC mandate which eliminates ''slack'' between 30 day listing renewals and keeps all GMV inventory available at all times). This is why so many of Wenig's inner circle, like Harry Temkin (and formerly Scott Cutler), have a data-heavy FInTech background with stock exchanges instead of retail or ecomm expertise. I don't know why they are announcing this just now as "test". I have had that option appear on offers I've made for the past 6 months or so, randomly. Wouldn't THAT have been the "test"? Maybe they were just testing the test back then. I'm beginning to think the entire eBay "experience" is a test. A test is what we can also refer to as throwing stuff at a wall and seeing what sticks. I try to make solid offers when appropriate, watching what has sold recently and using those as comparables. Many times a seller has priced upward a bit, and that is their right and choice. I do the same from time to time when I am selling, and I'm willing to flex a bit, too. Fast nickels are better than slow dimes, as the old saying goes. I'm not even sure it makes any difference what the offer time period is. The reaction time varies by the seller and his/her "style". Some like to get right back to you so you can move on (accept, decline, counter-offer), others like to leave the offer hanging there so they can use it as a lever on another offer/bidder. Wouldn't that be an AUCTION? Many times sellers have set auto-accept and/or auto-decline prices, so the time period may be moot. I noticed that in the announcement, this is the first sentence: "Best Offer is one of the fastest growing buying formats on eBay." I didn't know anything was growing on eBay, except growing old and tedious. LMAO - DW is watching too much television (CNBC). Hes watching hoping Cramer etc will say something nice about eBay ... which they wont. I say this because "Lets make a deal" is their new premier tv show. Well, Im not bald like Howie, and there are no models with breifcases holding 1 million dollars. MY (last I looked it was still MY listing) listings arent "lets make a deal". For a company thats "desperate" to remove the flea market image - this is the exact WRONG way to do it. I dont like being "ordered around" by eBays buyers. I dont need the "favor" or making a "DEAL" with you. Its bad business, it shows buyers that what ever thought a seller put into the listing (visa via the price) is/was just a waste of time. MY items and I can only speak for myself - are priced RIGHT the first time. If you want to by a few of something (assuming there is a few of them), THEN eail me and we can talk. Of course eBay is hungry to make sales - so this is the new GENIUS idea .... BUT - lower prices means lower FVF (dopes). Im guessing its like the old joke about the guy who inherited the candy store with the licorice - who sells at a loss - but will make it up in volume! The idiot (Tarman) said here: "Tarman, who holds a law degree and has a background in the financial services industry (PIMCO, Countrywide, Visa), said, "we're under no illusions of the challenges that we have to reenergize our brand and to also address some of our legacy perceptions that are not consistent with the current reality that eBay is an auction site, that eBay sells primarily used stuff, that it's like a flea market." Speaking of the stock-market like one-to-many tools, I noticed the Seller Hub active listings in for our eBay store have the "send offers to (multiple) buyers" feature activated as of today. @Lightning: When eBay foists these changes upon their users they then also exploit the benefit of marketing these very same (often unwanted) "features" are growing. Brilliant! "Your items are in peoples carts!" "GO FOR THE SALE"! emails you receive weekly? Go, go go, sell sell sell. Take anything for it, just sell it. We want our cut, who cares? So you lose a little money on fees, Paypal fees, our cut on the shipping end, HEY - here's a thought! Why not offer free shipping? HURRY! They might lose interest! Your item is in their carts? I wonder if Pierre Omidyar is sitting on a beach somewhere in the tropic of Fiji sipping on a colorful drink with an umbrella sticking out of it . . . surfing his iphone...on Ebay....Laughing his @ss off? Pace said, "LMAO - DW is watching too much television (CNBC). Hes watching hoping Cramer etc will say something nice about eBay ... which they wont." Hate to break it to ya brother but Cramer has man-crushed on Wenig, by name no less, a couple times since the Elliott letter dropped. Good luck with that! Most sellers are screaming mad. The best thing we can do is pack up shop and get the hell(o) out fast. There probably won’t be many good sellers in days to come. The whole point of an ''offer'' is the binding element it represents in any deal making. Which, on eBay, is no little bit of a ludicrious oxymoron, considering the lack of 'binding' behavior eBay enforces upon a buyer when they welch even AFTER accepting a seller's offer. That reality alone while it remains systemic renders this latest spaghetti noodle too slimy. Then there's the lack of any logic to this - consider; why would a seller who is dealing not want to accept (or timely counter) an acceptable offer asap? Immobile inventory isn't stock, it's a collection. Plus, dictatorial buyers (aren't they fun) can already state offer limitations, so this latest 'innovative' process adds unnecessary complexity in both process and procedure, increasing chances for 'glitches'. But even with wholly undeserved benefit of doubt, call it the next latest 'sliced bread', it still remains true that dancing a tango alone isn't a tango, especially to the tone-deaf eBay band. Talk about a bunch of 'noise' worthy of ignoring (if you can). That goes for any 'impatience' perceived via this new toy too. Fido - you are way more right on CNBC then I am - I never watch it - no idea if Cramer loves him or not. So - yeh apologies :) . I think Cramer etc have all said that eBay is a good safe long term buy since they wont be going OOB anytime soon since there are always people who want to sell things on the site - ie they never run out of customers. That being said ..... at least some of the shareholders are starting to realize that the emperor indeed has no new clothes. This is the 2nd major misstatement/policy flip in 1 month (1rst long tail = stale item - BUT WAIT now they dont and they are all GTC) and now this). We pay eBay for the privilege of a store and we pay our eBay fees. Why can't we just be left alone? As a seller, I have found the Best Offer feature to be insulting. I tried it for a week or so, and buyers were making ridiculously low offers. I responded as politely as I could and then promptly blocked them. I mean, if they're idiots before the sale, they'll be a nightmare afterwards, IMO. What's even worse is that eBay keeps adding the feature back onto my listings and I keep going in and removing it. On my items buyers will have the opportunity to express their price opinions when I list an item at auction (rare). My fixed price listings will remain so. @FidoMaster - how does the option to send offers to watchers show up in your listings. I have yet to see that. Because I am anti-GTC, I had to start listing auctions ONLY. 7 days. No matter, I'm done with Ebay. And somebody please remind me again the logic of having a "make an offer" alongside auctions? Thank goodness I'm doing well on AMZ. Way better than Ebay. Once again - implement a new change and not have all the bugs worked out. A buyer can set how long the offer is good for but CS still have to check to see if a seller can shorten the time a buyer has to accept the offer - many of which after accepted end up as INRs. Just like our new GTC that never took into consideration that many months have 31 days and so may incur duplicate fees. @iheartjacksparrow ~ Hush, don't be giving Wenig any ideas! !